Do you find you keep losing your Apple Pencil? You're not alone. We find some solutions to wayward iPad styluses. The Apple Pencil is a glorious thing. A true designer's tool, our reviewer reckons it is the best digital drawing tool there has ever been. 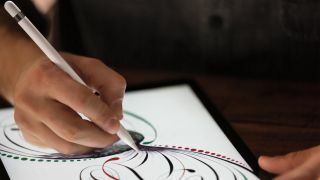 It feels right to hold, it is weighted perfectly, and it pairs with the iPad Pro and various apps to create a peerless digital drawing experience. However… Apple's relentless quest for minimalism led the Pencil to be completely cylindrical which has led to a major issue – it can roll off anything but the most level surface, and that can lead to it being lost or damaged. So how can you keep hold of your precious Pencil? We took a look at some of the available accessories plus some devilishly clever hacks to ensure your stylus stays put. If you are using a Smart Keyboard with your iPad Pro, you'll find that it is mildly magnetic along the left-hand edge, and the Apple Pencil will just about cling on. Okay, this is not a long-term solution but it will stop the Pencil from rolling away on its own if you leave your desk. Moxiware has produced a very Apple OE-esque set of sleeves for the Pencil, that give it a truly magnetic connection to your iPad Pro. Get hold of one here. Reddit user texasdoesitbest discovered that the Pentel Sharp Automatic Pencil's removable metal clip fits the Apple Pencil exactly. And as it is chrome, it even matches the Pencil's shiny metal band. Discover how it's done here – great gadget hack! Premium notebook-maker Leuchtturm1917, which is the notebook preference of some of the CB office, sells a handy pen loop to attach to its stationery. It is a quality item, as befits the Leuchtturm1917 brand, and Tumblr blogger #MykeWasRight spotted that this would make an excellent Apple Pencil holder. Belkin's Base for Apple Pencil gives you an elegant storage solution to keep your stylus protected between uses. It has been crafted out of aircraft-grade aluminium with a beautiful chrome finish, and it is specifically designed for the Apple Pencil. Its compact size ensures a seamless fit to any desktop space and the base has a nice heft to ensure stability and added protection for the tip of your Apple pencil. It doesn't charge, but it does look very cool – and it does the job of ensuring you know where your Pencil is with aplomb. Like foul-mouthed Glaswegian illustrator @davidgalletly has. F*****g cool. The Stylus Sling is a way to strap your Apple Pencil to your iPad to ensure it's with you at all times. A little utilitarian in design, it maxes on effectiveness – and it cleverly has a little pocket to slot the lightning connector cover into so you don't mislay that, either. Pencil by 53 is a great stylus – it allows you to write and draw from any angle, there's an eraser on the end of the stylus, and the battery only needs recharging once a month. But most importantly for our purposes here, it's larger, flatter, and won't roll off your desk when you least expect it. Find out more about it here!